I heard a great quote from my mentor Raymond Aaron this week and felt the need to spread the word. It really opened up my thoughts when I heard it. Just the kind of thing I promised to deliver on this blog (read my About Page). The quote goes like this—We are kept from our goal not by an obstacle, but by a clear path to a lesser goal. WOW! It’s not the big obstacle in the way that stops us. It is a clear path to the easier goal! If you just follow the path to the easier goal then that’s good. You made the goal. But when your real goal gets lost because the lesser goal has been attained that is not good. 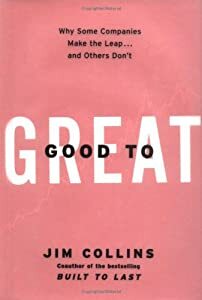 The #1 Bestseller from Jim Collins, Good to Great, teaches the lesson that the enemy of great is good. If you attain something and deem it good then that is good enough. No need to do more, it’s good. Mind you it is not great! Your purpose in your lifetime, I believe, is to share the gifts you have been given. To strive to give the world your select set of skills in your own way. In order to do this, you must resist the temptation to reach the easy goals and keep taking the next step to your ultimate goal.